Chief Analyst Usman Ansari wonders if the potential discarding of the Royal Navy’s key amphibious warfare ships may destroy British prestige and global influence, with other leading navies going in the opposite direction to the United Kingdom. The helicopter carrier HMS Ocean, a vessel that gives the UK a place at the top table of world affairs. She is scheduled to be retired from service in 2018 without direct replacement. Photo: US Navy. The Royal Navy is dangerously underfunded, to the tune of some £350 – £500 million a year, hence the search for potential cuts to critical capability in order to save money. Funding set aside by UK governments does not in reality match the vision of a well-balanced globally deployable fleet able to safeguard Britain, its citizens overseas along with strategic and economic interests. The UK’s amphibious capability is low hanging fruit to be plucked in order to allegedly free up funds and people for big-ticket items such as the new carriers. Besides possibly cutting 1,000 plus Royal Marines, the culling of the two Albion Class Landing Platform Docks (LPDs), alongside planned disposal of the helicopter carrier HMS Ocean, represents a serious reduction of an already hollowed out RN. That the new Queen Elizabeth Class carrier Prince of Wales can provide a workable alternative to the LPDs and Ocean is a case of finding a purpose for a ship, rather than retaining the ships fit for the purpose. The two new UK carriers are needed to do their main job of providing fixed-wing air support while the dedicated amphibious assault ships shift personnel and equipment, send military supplies across the beach (via both landing craft and helicopters) or act as sea bases for raiding parties or boarding teams to exert area control. When not at war these incredibly valuable vessels deliver vital humanitarian aid and disaster relief and can even save people struggling to stay alive after a people trafficking boat sinks. 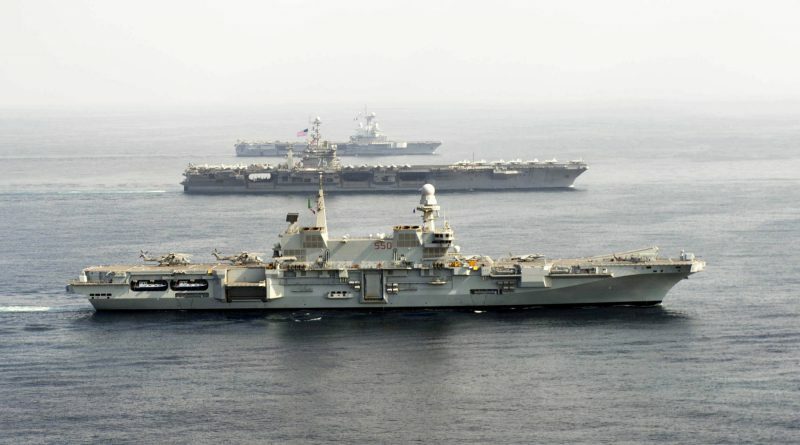 The Italian Navy strike carrier and amphibious warfare vessel ITS Cavour (with both Harriers and helicopters embarked) on operations with the American strike carrier USS Harry S. Truman (middle) and French strike carrier FNS Charles de Gaulle (furthest). Photo: US Navy. The LPDs are powerful command and control platforms too, as is Ocean, while they are also nimble enough to operate with as much safety as possible in the littorals or confined waters. The three Landing Ships Dock (Auxiliary) vessels of the Royal Fleet Auxiliary (RFA) are equally valuable in roles as varied as aid delivery or mine warfare support vessels. Yet they are a supporting component of amphibious forces, not a substitute for LPDs or a helicopter carrier. Other nations have preserved, or are striving to expand, amphibious warfare capabilities even in the face of financial pressures because, unlike Britain, they are willing to pay for them. The UK Govt refrain against accusations of systematically underfunding the Navy is to highlight the new carrier and frigate programmes plus renewal of the national deterrent. However, the cost of the latter was only introduced into the defence budget in 2010 – contributing considerably to the present financial crunch – having previously been funded by the Govt Reserve Fund. The previous logic was that the deterrent is a political weapon not a war-fighting system and so should not eat into funds for conventional forces. Despite this very sensible approach the then Chancellor of the Exchequer George Osborne thought differently and so placed a crippling millstone around the neck of the UK Armed Forces. Furthermore, the other major RN programmes, though providing impressive new equipment are not in themselves delivering anything unique compared to other navies, despite official spin by the Navy and Government. Other comparable top-flight navies have similar capabilities, or are acquiring them, so the UK is merely keeping pace (if that). Even when facing financial constraints other nations have invested in strike carriers while also maintaining and investing in amphibious capabilities (to ensure they retain a balanced fleet with full spectrum capability). The powerful amphibious assault carrier USS America (nearest) on maritime security patrol in the Gulf of Aden with the Landing Platform Dock (LPD) USS Pearl Harbor in September 2017. Photo: US Navy. 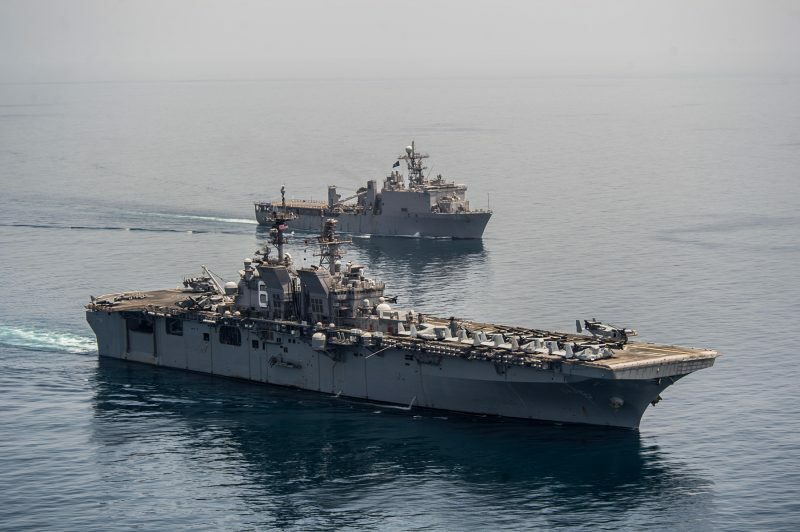 In a league of its own is the US Navy, with unrivalled amphibious assault capability used to good effect to underpin its global presence and influence. This it does via around 40 amphibs, some of them assault carriers with stern docks for landing craft and large hovercraft, plus LPDs (with more being built) and also assorted other craft. France has faced tough choices over the past decade, consequently shelving plans for a second strike carrier and limiting Horizon destroyer and Aquitaine frigate numbers. 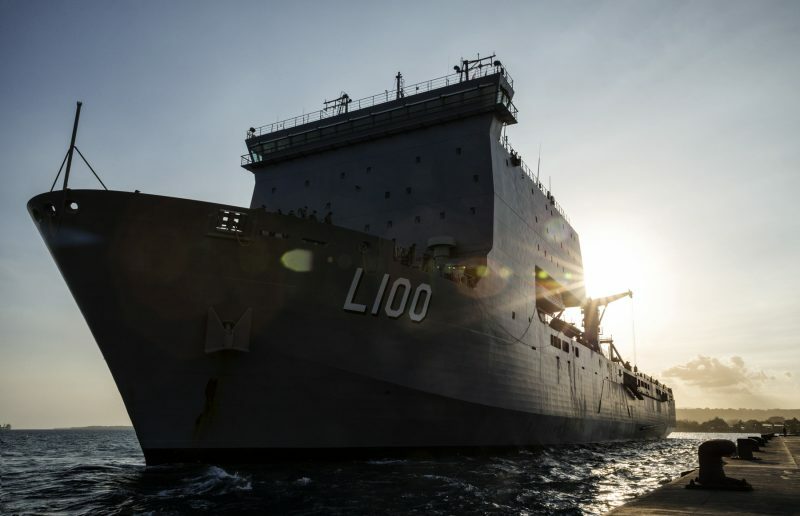 Though plans for a fourth Mistral Class Landing Helicopter Dock (LHD) were scrapped, the Marine Nationale and its amphibious assault capability remain strong. The French LHDs are likely to survive the latest planned cuts, which may fall heavily on the army. 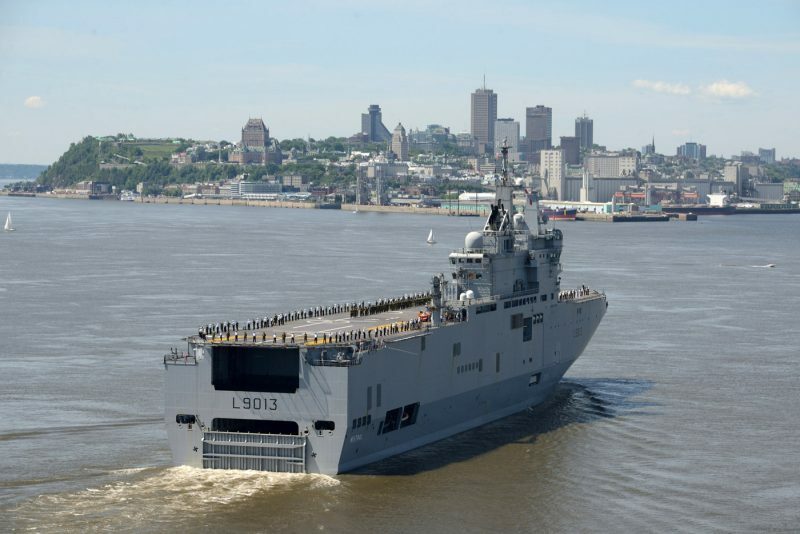 The French Navy amphibious warfare ship Mistral sails into Port of Quebec to make friends and influence people. Photo: Canadian defence ministry. Amid severe financial woes Italy has not only managed to preserve its amphibious assault capabilities, but also the Harrier II maritime strike jet. The new strike carrier Cavour can launch landing craft while an impressive Trieste Class assault carrier was laid down in July. This ship will not only host marines, but also F-35B strike jets, helicopters and be able to launch landing craft (from her own stern dock). 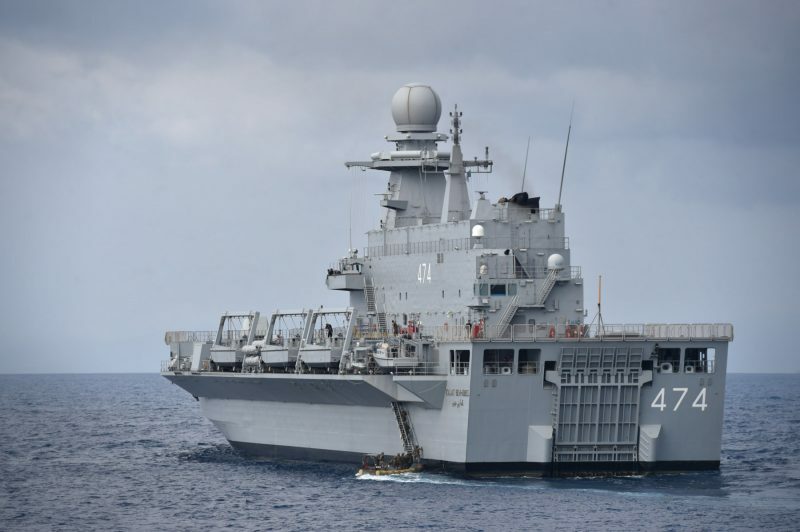 There will also perhaps be two more amphib vessels laid down by Italy in the next couple of years. Similarly, Spain has retained its Harrier strike jets too and its Juan Carlos carrier can, like the Italian ships, also launch landing craft. In addition the Spanish fleet also has two LPDs. Turkey is expanding its amphibious forces and is constructing its own variant of the Juan Carlos while Australia has recently commissioned two such vessels while also buying a Bay Class landing ship discarded by the UK in the 2010 defence review. Russia’s 2008 intervention in Georgia exposed its amphibious shortcomings. Sanctions prevented acquisition of Mistral Class assault carriers (built jointly by Russia and France) to replace some of its elderly amphibious vessels. Additional strain from the Syrian intervention may have cut finances, but Russia maintains dozens of amphibious warfare vessels while new vessels will be built in time. Egypt acquired both the above Mistral Class assault carriers from France, while neighbour Algeria is getting into the amphibious warfare game and recently commissioned an Italian-built helicopter carrier (with landing craft capability). The new Algerian Landing Helicopter Dock (LHD) Kalaat Beni-Abbes during a 2016 multinational exercise. Photo: US Navy. China’s amphibious assault capabilities are increasingly impressive. Twenty years ago any suggestion Beijing could militarily occupy Taiwan was derided as the ‘million man swim’. Today China can move tens of thousands of marines plus their equipment via a growing amphibious assault fleet, already numbering dozens of ships, and soon to include helicopter carriers. Both the Japanese and South Korean navies have plentiful amphibious forces, including numerous assault carriers (some with landing craft capability). 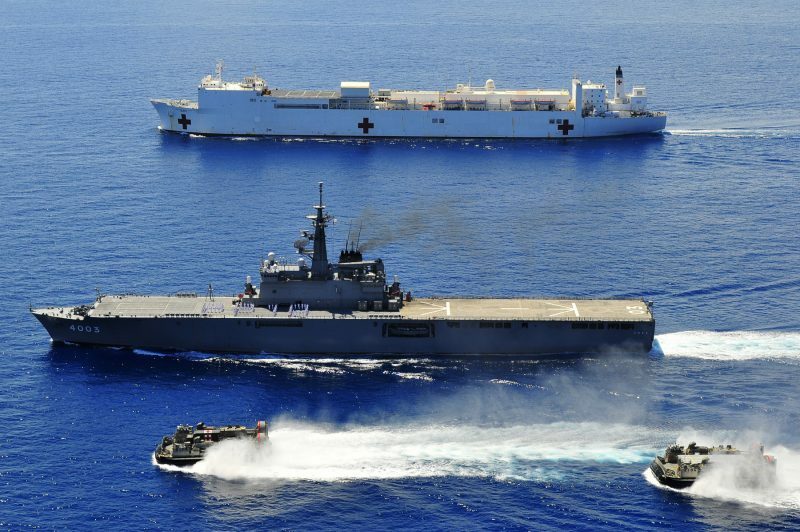 The American naval hospital ship USNS Mercy and Japanese Maritime Self-Defense Force (JMSDF) amphibious assault ship JDS Kunisaki and two Japanese Landing Craft Air Cushions in the South China Sea. Photo: US Navy. India is also seeking to improve its amphibious assault capability, and may actually be quite happy to buy both British LPDs to compensate for delays in its ‘multi-role support vessel’ programme, replace its aging ex-American LPD. The ex-RN vessels would complement the current Landing Ship Tanks (LST) and Landing Craft Utilities (LCU) operated by the Indian Navy. Yet what could be India’s gain would diminish Britain’s ability to respond to crises, crippling its power projection capabilities and crisis response in both in war and peace. The most effective solution to the funding crisis afflicting Britain’s navy is to increase the budget devoted to fielding front line capabilities. Some analysts have blamed the carrier programme for sucking money away from the rest of the fleet but it was government decisions (delays) that caused costs to blow out. Many people hoped post-Brexit, with Theresa May becoming PM, Britain would turn back to the sea with vigour. The defence budget would be raised and the Navy actually enlarged with the RN capable of offering both a Carrier Strike Group (CSG) and Amphibious Ready Group (ARG) like most leading navies. Instead the lack of funds most likely means a further degradation of maritime capabilities and a narrowing of UK options in times of trouble. Critical mass, so vital in waging any combat operation, is also being further sapped. Running the present course means that despite the new strike carriers, submarines and destroyers, the small Royal Navy will be lucky to survive combat against a peer opponent. It would probably be badly mauled against even a second rate power. Britain’s place in the world is at risk. The permanent members of the United Nations Security Council (UNSC) operate ballistic missile submarines, strike carriers and major amphibious warfare ships. If the RN’s amphibs go it has to be asked does the UK still deserves its seat? Might it be better gifted to the European Union (which offers the full triumvirate of naval power) or even India? The latter now has SSBNs and a much large navy than the UK’s. It only lacks a full-scale amphibious group to supplant the UK in full spectrum naval operations. 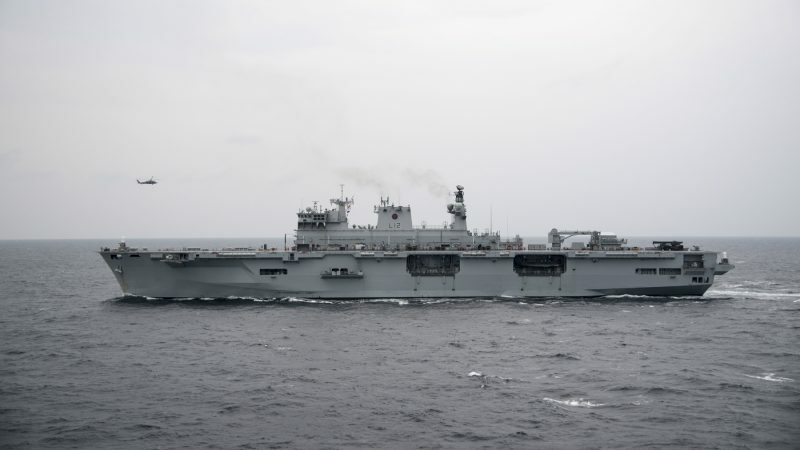 Buying the UK’s discarded amphibious ships would complete the necessary triad, though India would be a very tricky choice likely to provoke strong objections from fellow nuclear power Pakistan. Either way, rather than reinforce the Royal Navy and strengthen Britain’s global outlook and presence, the government of Theresa May seems intent on fatally weakening it. Additional material by Iain Ballantyne.